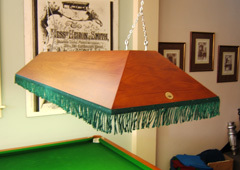 Lighting for the home billiard table often used to present a problem: how to make it functional without it becoming unattractive. 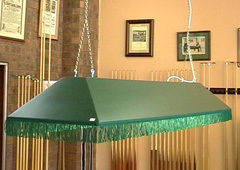 It was recognized that a " Canopy Type" of design produced the most reliable, even light, concentrated on the table; but a number of people thought it too dominant, particularly in a multi-functional room. Nowadays there are many solutions offered to deal with the lighting issue. Only a small number of these can be presented here. 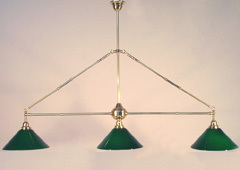 Some lights feature a metal frame with a series of glass or metal shades. Fully polished to match your table.